New York and U.S. premieres of technologically complex contemporary music and performance art … full of promise but ultimately disappointing. Run Time Error, an evening of recent and new works, including both New York and United States premieres composed by Simon Steen-Andersen, who performed with the JACK Quartet, had all the makings of a wonderful evening. Steen-Andersen, Danish born and now Berlin-based composer has received numerous accolades and awards internationally. 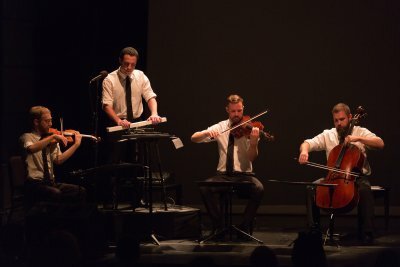 JACK Quartet – Christopher Otto/violin, Ari Streisfeld/violin, John Pickford Richards/viola and Kevin McFarland/cello – are stunning musicians equally at home in traditional classical and contemporary experimental literature. Run Time Error should have been marvelous: there were all sorts of promising elements. It was meant to be a splendid opening to Miller Theatre’s 27th Season. There were indeed some fun parts, but it wasn’t marvelous. Steen-Anderson was described in the program as a “composer, performer and installation artist, working in the field between instrumental music, electronics, video and performance within settings ranging from symphony orchestra and chamber music (with and without multimedia) to stagings, solo performances, and installations.” Over several weeks before the performance, Steen-Andersen filmed sound-making events within Miller Theatre (bells, doors, objects bouncing down stairs, or rolling down corridors) and then the composer and the JACK musicians making sounds (tapping, banging, thumping) and finally making occasional musical sounds on musical instruments. The results were projected in a film run on two adjacent screens, both controlled by Steen-Andersen on joy-sticks so as to manipulate the images simultaneously – or edgily, jumpily almost simultaneously – or backwards or quick-step back-and-forth. This film projection opened the evening and then, almost exactly replicated, closed it, setting up “bookends” to a deftly symmetrically organized sequence of pieces. 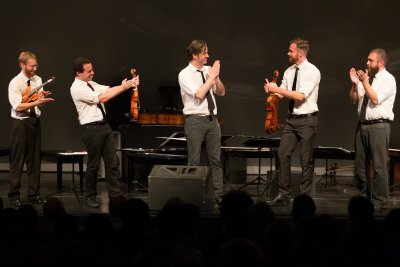 Within the rest of the concert, whose pieces moved continuously from one to the next without pause, videos alternated with, or sometimes served as backdrop for, JACK Quartet’s presentations of pieces composed between 2007 and 2015. JACK’s performances were recorded-on-video, live and simultaneous with video. Steen-Andersen challenges both the musicians and the instruments to behave as they typically never do. The instruments are played as their makers never imagined possible … or appropriate. The rhythms are lightening-quick-difficult; occasional resolutions of harmonic dissonances evoke historically distant ideas of melodic beauty. By and large, however, Steen-Anderson operates in a “modern” realm of relentless challenge to traditional ideas of beauty, opting for sounds that settle into patterns and perspectives at odds with inherited nineteenth century aesthetic standards. But this territory is not new. The attempted navigation of paradoxes in which the raucous and the graceful switch places, organic and inorganic, and fluid and angular all merge, and familiar certainties bleed out into confusion has become a relatively familiar project … a developmental phase in which many talented young artists find themselves engaged as they go about establishing their own vocabularies. Unfortunately, Steen-Andersen doesn’t seem to have added original or forward-minded insights to the endeavor. Steen-Andersen does, however, make explicit reference to a particular historical example of musical beauty in three “Obstruction Studies,” composed in 2012 and interspersed geometrically in the tight parallel architecture of the program. In these pieces, performed by JACK mostly on video, Otto, Streisfeld, Richards and McFarland played sections of Robert Schumann’s 1842 A Major Quartet, Op. 41 No.3. Steen-Andersen’s hampering of the musicians’ ability to play Schumann’s music served no discernible purpose. It neither illuminated nor enhanced Schumann. For those familiar with Schumann’s quartet, the inhibited, constricted performance was sad. Nor did Steen-Andersen’s perverse appropriation of Schumann’s music advance Steen-Andersen’s inquiries in any identifiable way; one wondered whether Mozart or Haydn (or Buxtehude or Fussel) might have done just as well. For those who didn’t know Schumann, the attempted wit of “Obstructionist Studies” – a crude debunking of reverence for traditional works of art – was weak at best. One piece, at least, was genuinely delightful. The 2009 “Study for String Instrument No. 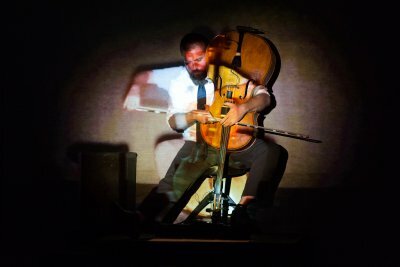 3” is, according to the program notes, “a cello solo … or, rather, a cello duo, for live performer and projected image.” Cellist McFarland, sitting on a platform on the stage in front of a live projection of himself, played Steen-Andersen’s complex, demanding music with an air of deadpan normalcy, as though upside down, sideways and belly-down are regular cello-performance positions. Screwball virtuosity. Steen-Andersen is intensely smart, happily brainy; he is a gifted composer. But Run Time Error was disappointing. The initial promise of humor in the opening minutes of the video wore thin; inventiveness proved limited. The university setting revealed the evening’s limitations: the installation videos with interconnected music performances were self-referential and sophomoric. But Columbia University contains passionately engaged men and women in all disciplines who seek to use the insights of their working lives to improve the world around them. Immediately beyond the walls of Miller Theatre where Steen-Andersen found the sounds with which to play his games are much more provocative sights and sounds, rich and urgent material waiting alert artists’ use in genuinely consequential question asking and answer seeking. Steen-Andersen’s essentially uninventive exploration of familiar “modern” paradoxes seems inadequate in the face of everything that lies immediately beyond Miller Theatre. Two features of the evening saved it from failure. JACK can do anything. They are fabulous musicians, capable of dazzling performances. They approach every task to which they commit themselves with integrity and dedication. They pulled off Steen-Andersen’s music without a hitch, as though it were quite easy. Only the best can manage that. And a spirit of lively camaraderie held the musicians to each other, the composer to the musicians and the five performers – Steen-Andersen and JACK – to the audience. The men on the stage were having a genuinely good time. The audience was entirely enthusiastic; their applause was lengthy and noisy. Everyone seemed to have fun. Steen-Andersen has the talent, the technical skills and the imaginative drive to create exciting works of art. Unfortunately, Run Time Error proved not to be one, in spite of JACK’s fine performance. Jean Ballard Terepka, a native and life-long New Yorker, has been writing about music for twenty years. In addition to her continuing career as an independent educational consultant, Terepka also works as an archivist and historian with specialties in American cultural, intellectual and religious history. Terepka serves on the Executive Committee of the Harlem African Burial Ground Task Force and on the Board of National Episcopal Historians and Archivists; she is a member of the Music Critics Association of North America. An evening of complex, forthright and exciting music by a composer of both achievement and promise. Dynamic, internationally renowned musicians premiere a complex, exhilarating and rewarding new work by transplanted German composer. An extraordinary and intimate evening of dazzling contemporary music for strings and percussion. A fabulous string quartet plays works from a distinguished composer’s adolescence and from his eightieth birthday year. Recent and new works by contemporary Swiss-Austrian avant-garde composer, played with virtuosity and integrity.